'Gold Class' hearkens back to the days of old and the presence of 'Gold Eagle' in our fields. 'Gold Eagle' was lost to field flooding in Oregon years ago, and since that time we have scoured the world looking for a suitable replacement for that big, empty spot left in our hearts and in our garden following its loss. 'Gold Class' not only a suitable replacement, she is 'Gold Eagle' brought to the next level of excellence. These semi-pendant to outfacing flowers are quite graceful and what really sets them off is the wonderful red markings found in the centers of the flowers. They not only remind us of 'Gold Eagle' but also bring back fond memories of L. paryii, one of the most magnificent of the wild California lilies flowering in the garden at the front of our home. 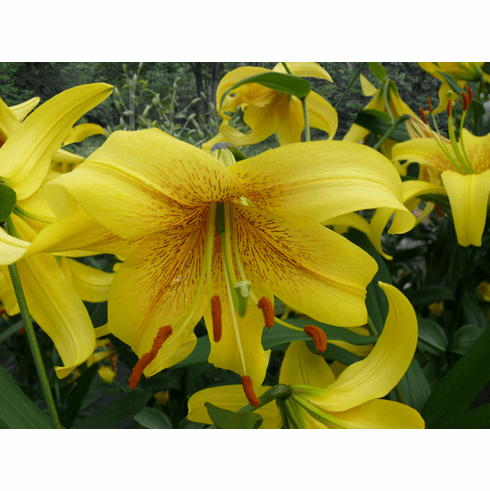 A bold and wonderful rich canary yellow in color, expect to see her flowers opening in July and to be held on 3 to 4+ foot stems. Yes, 'Gold Class' is fragrant. 'Gold Class' takes a full year to really settle in after being moved and usually only produces 1 or 2 flowers the first season. Please Note: Photo inserts are of the beautiful L. parryi as a point of reference since it is mentioned in the description of 'Gold Class'. L. parryi is not available for spring delivery this year.